Another weekend, another shower. But instead of another wedding shower, it was a baby shower! Another fun thing to make gifts for. There are so many great ideas of items to make. I stuck with some of my favorites. Blankets are always a good gift. Baby girl is due in December, so it will be perfect weather to snuggle up in this super soft material. I actually made two blankets, a large one (about 42" x 36") and a small stroller blanket (18" square) to use in the car or on the go. One side was a fun print. Mom isn't into too much pink, so I found a print that could still be girly. Teal blue is one of my favorite colors too. I chose a cotton for the print and a super, plush teal fabric for the back. This kind of material is a bit difficult to work with since it stretches and always seems to slide around. 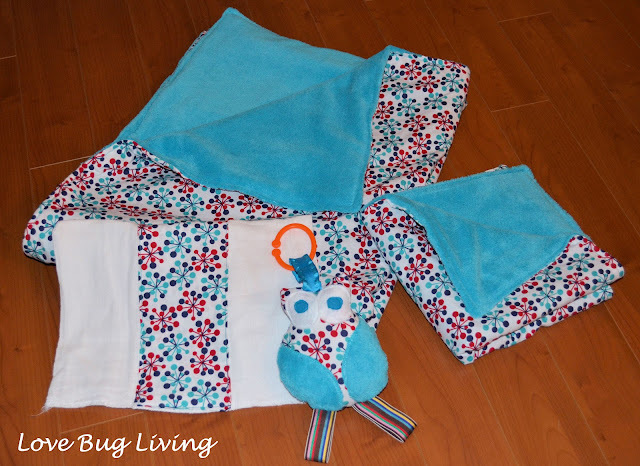 To make a blanket, cut a piece of your front and back material into whatever size you want. Line your fabrics up, right sides together. Use lots of pins to pin them together. Sew around the outside, leaving a section open. Turn your blanket right sides out through your open section. Sew around the edge of the blanket. This will close up the section you left open and give your blanket a finished look. This is how I made both of my blankets. After finishing my blankets, I had some extra material left over. I used one strip of the printed material and added it to a cloth diaper to make a burp cloth. 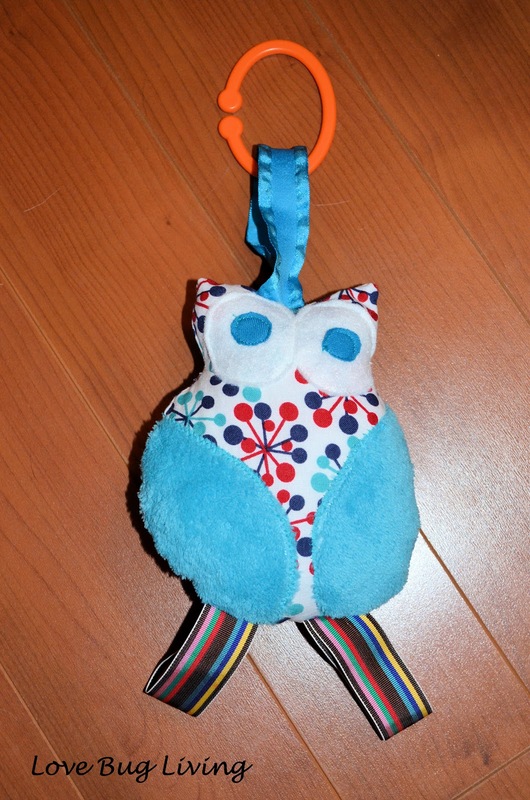 I guess I was on a roll, because then I decided to make a matching owl toy to hang from the car seat. I used the owl pattern by Paula Storm on Sew Little Fabric. I adapted it a little to make it my own by adding a loop to hang him by and a couple of loops of fabric for his feet. Isn't he cute?! Another of my favorite baby items to make is a Baby Necklace Onesie. So cute and so easy! No painting experience required. Check out my tutorial to make your own. The last item I made were baby leggings made out of knee high socks! My daughter has a ton of these. They are so much easier to change diapers with than tights! You can whip up a pair in about five minutes too. I love that there are so many fun printed knee socks out there. I'm always looking out for a good sock clearance. Target is a good place to check. Check out the full tutorial. The baby shower was definitely a fun day with old friends, some that I hadn't seen in quite a while. This baby is joining a fun group! We are all so excited to meet her and so happy for her mom. Can't wait to have her running around the soccer fields with all of the other little ones. Congrats Kel!